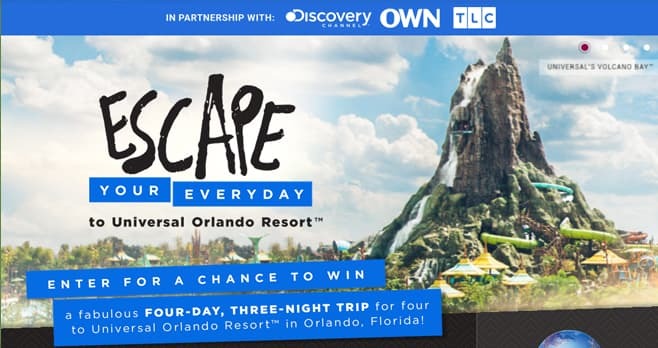 Enter the HGTV Escape Your Everyday Sweepstakes at HGTV.com/EscapeYourEveryday and you could win a fabulous four-day, three-night trip for four to Universal Orlando Resort in Orlando, Florida. The HGTV Escape Your Everyday Sweepstakes is open only to legal residents of the contiguous 48 United States and D.C. who are 21 years of age or older as of the Promotion start date. The Sweepstakes begins at 9:00 a.m. ET on March 15, 2019 until 5:00 p.m. ET on April 26, 2019. There is a limit of one (1) entry, per valid email address, per eligible person, per day. The grand prize consists of a trip for four (4) to Universal Orlando Resort in Orlando, Florida. Visit HGTV.com/EscapeYourEveryday to enter and see Official Rules for details.